Received September 21, 2016; Revised November 4, 2016; Accepted November 7, 2016.; Published online November 18, 2016. The innate immune system has evolved to detect and destroy invading pathogens before they can establish systemic infection. To successfully eradicate pathogens, including viruses, host innate immunity is activated through diverse pattern recognition receptors (PRRs) which detect conserved viral signatures and trigger the production of type I interferon (IFN) and pro-inflammatory cytokines to mediate viral clearance. Viral persistence requires that viruses co-opt cellular pathways and activities for their benefit. In particular, due to the potent antiviral activities of IFN and cytokines, viruses have developed various strategies to meticulously modulate intracellular innate immune sensing mechanisms to facilitate efficient viral replication and persistence. In this review, we highlight recent advances in the study of viral immune evasion strategies with a specific focus on how Kaposi’s sarcoma-associated herpesvirus (KSHV) effectively targets host PRR signaling pathways. Kaposi’s sarcoma-associated herpesvirus (KSHV) is a large double stranded DNA virus that has been identified as a causative agent of Kaposi’s sarcoma (KS), primary effusion lymphoma (PEL), and multicentric Castleman’s disease (MCD) (Ganem, 2010; Nador et al., 1996; Soulier et al., 1995). Just like other herpesviruses, KSHV displays biphasic life cycles known as latency and lytic replication. In latency, very few genes are expressed without producing progeny virions (Chang et al., 1996; Dittmer et al., 1998; Kedes et al., 1997; Zhong et al., 1996). Under specific conditions, KSHV can undergo lytic replication, resulting in the expression of almost all of the viral genome and the production of new viral particles by the replication of viral genomic DNA. Remarkably, accumulated data indicates that regulation of host immune response is critical for maintaining these viral life cycles (Lee et al., 2012). Thus, a large portion of the KSHV genome is devoted to immunomodulatory proteins that subvert the host immune system to ensure viral persistence (Lee et al., 2015). Upon viral infection, the innate immune response is immediately engaged by pattern recognition receptors (PRRs) sensing of conserved molecular features of pathogens, called pathogen-associated molecular patterns (PAMPs) (Brennan and Bowie, 2010; Brubaker et al., 2015; Hoffmann and Akira, 2013; Lee and Kim, 2007). Currently, five types of PRRs are known: Toll-like receptors (TLRs), retinoic acid-inducible gene-I (RIG-I)-like receptors (RLRs), nucleotide-binding oligomerization domain (NOD)-like receptors (NLRs), absent in melanoma 2 (AIM2)-like receptors (ALRs), and cytosolic DNA-sensing receptors (Brennan and Bowie, 2010; Brubaker et al., 2015; Cai et al., 2014; Hoffmann and Akira, 2013). These PRRs induce intracellular signaling cascades that upregulate expression of pro-inflammatory cytokines and type I IFNs, which ultimately amplifies innate immune signaling and coordinates adaptive immune response to clear pathogens (Paludan et al., 2011; Takeuchi and Akira, 2010). Hence, viruses directly modulate PRR activity to dramatically alter the efficacy of innate immune responses for their benefit. Here, we present recent advances of how KSHV circumvents the surveillance network of PRR signaling pathways to avoid inducing the potent IFN and pro-inflammatory cytokines. Among PRRs, TLRs were the first to be identified and are the best characterized. Structurally, TLRs consist of extracellular leucine-rich repeats (LRRs) domain for ligand recognition and a cytoplasmic Toll/interleukin-1 (IL-1) receptor homology (TIR) domain for the recruitment of adaptor molecules (Brubaker et al., 2015). To date, 13 TLRs have been identified. TLR ligand recognition is mediated by their localization to different subcellular compartments. One group of TLRs (TLRs 1, 2, 4, 5, 6, and 11) is found in the plasma membrane and sense lipids, lipoproteins, and proteins. The other groups of TLRs (TLRs 3, 7, 8, and 9) are localized at the endosomal membranes and primarily recognize nucleic acids (McCartney and Colonna, 2009; O’Neill et al., 2013). Ligand binding first promotes the dimerization of TLRs, which serves as a platform to recruit two TIR domain-containing adaptor proteins, MyD88 and TRIF. Consequently, transcription of inflammatory cytokines and type I IFNs are initiated through the activation of NF-κB and IRFs by either MyD88-dependent or TRIF-dependent pathways (Akira et al., 2006; De Nardo, 2015; Lee et al., 2015). The association of all TLRs, except TLR3, with MyD88 sequentially stimulates the recruitment IRAK, activates TRAF6 and TAK1, and ultimately activates NF-κB and AP-1 activity through the respective IKK complex and MAP kinases. In contrast to the MyD88 dependent TLR signaling, TRIF is recruited by TLR3 and TLR4 to activate NF-κB by two independent ways: the N-terminal domain of TRIF directly interacts with TRAF6, leading to the activation of NF-κB, whereas the C-terminal domain of TRIF interacts with RIP, causing activation of TAK1 (Beutler, 2009; Brubaker et al., 2015; De Nardo, 2015; Kerur et al., 2011). TLRs promote inflammatory cytokines and type I IFN signaling in response to viral infection by detecting multiple viral PAMPs. TLR3 senses either the genomic component of double-stranded RNA (dsRNA) viruses or an intermediate of the replication of single-stranded RNA (ssRNA) viruses (Iwasaki and Medzhitov, 2004). TLR7 and TLR8 recognize genomes of ssRNA viruses and TLR9 recognizes genomes of double-stranded DNA (dsDNA) viruses (Bauer et al., 2001; Brubaker et al., 2015; Iwasaki and Medzhitov, 2004). Hence, it is not surprising that KSHV has learned to manipulate these TLRs-mediated host immune control mechanisms to facilitate its life cycle. KSHV stimulates TLR3 gene expression that ultimately induces several cytokines and chemokines, including IFN-β, CCL-2, and CXCL10, during de novo infection (Lee et al., 2015; West and Damania, 2008). However, at later time points of infection, TLR3 expression is reduced, due to inhibition of the TLR3-mediated induction of IFN-responsive promoters by KSHV encoded vIRF (viral interferon regulatory factor)-1, -2, and -3 (Jacobs et al., 2013; West and Damania, 2008). Interestingly, among vIRFs, only vIRF1 decreases phosphorylation and nuclear translocation of IRF3 upon TLR3 activation, suggesting that vIRF1 and other vIRFs block TLR3-mediated IFN-β production in different manners (Jacobs et al., 2013). Recently, Jacobs et al. (2015) demonstrated that vIRF1 interacts with cellular ISG15 E3 ligase HERC5 and decreases global IS-Glyation in the context of TLR3 activation. Together, these findings suggest that each vIRF may uniquely inhibit the TLR3-mediated antiviral responses. Infection of THP-1 monocytes with KSHV leads to the inhibition of both TLR2 and TLR4 signaling by several different viral ORFs including ORF21, ORF31, and RTA. Particularly, the KSHV replication and transcription activator (RTA) that functions as a major transcription factor and E3 ligase, strongly downregulates TLR2 and TLR4 signaling by causing their degradation (Bussey et al., 2014). However, the underlying molecular mechanism of RTA-induced TLR degradation is unclear due to the nuclear localization of RTA and cell surface localization of these TLRs. One possible mechanism is that RTA may employ unknown nuclear host factors that mediated TLR degradation via indirect manners. During infection of lymphatic endothelial cells, KSHV expression of viral G-protein coupled receptor (vGPCR) and vIRF1 activates the extracellular signal-regulated kinase (ERK) that in turn suppresses TLRs expression (Lagos et al., 2008). Remarkably, HIV-1 infected patients harboring TLR4 SNP have higher rates of KSHV-associated MCD compare to other subjects (Lagos et al., 2008). Agonist specific activation of TLR7 and TLR8 reactivates KSHV from latency (Gregory et al., 2009). Later, West et al. (2011) reported that induction of IFN-α in KSHV infected human dendritic cells occurs through the stimulation of TLR9-mediated signaling. Taken together, these findings are evidence that KSHV employs various strategies to escape TLR-mediated detection throughout its lifecycle that ultimately allows KSHV to establish viral latency in diverse cell types. Given that TRIF is essential for TLR3 signaling, the RTA-mediated degradation of TRIF blocks the TLR3 signaling pathway, and consequently blocks IFN production (Ahmad et al., 2011; Meyer et al., 2013). Meanwhile, TRIF enhances KSHV RTA protein expression as a potential regulatory loop (Meyer et al., 2013). In the other words, the activation of TRIF leads to enhanced RTA protein expression. Subsequently, RTA degrades TRIF and ultimately inhibits the activation of TLR-mediated innate immunity (Meyer et al., 2013), suggesting that RTA utilizes TRIF to escape the host signaling for their own benefits during their life cycles. MyD88 is another key adaptor that initiates signal transduction pathways for all human TLRs except TLR3 to produce pro-inflammatory cytokines and type I IFNs (Brubaker et al., 2015; De Nardo, 2015; Lee et al., 2015). Consistent with the destabilizing role of RTA on TRIF, Zhao et al. recently found that RTA directly interacts with MyD88, leading to the proteasomal degradation of MyD88 and suppression of TLR4-mediated NF-κB activity as well as IFN production (Zhao et al., 2015). Moreover, MyD88 is downregulated during early stages of de novo infection and lytic reactivation. Overall, KSHV RTA is a crucial virulent factor that utilizes multiple strategies to inhibit effective TLR-mediated signaling. Interleukin-1 receptor-associated kinase (IRAK) is a family of four serine/threonine kinases that associated with the IL-receptor: IRAK-1, IRAK-2, IRAK-M, and IRAK-4. IRAK-1 is composed of an N-terminal death domain that interacts with MyD88 and a central kinase domain (Takeda and Akira, 2004). Among them the 18 mature miRNAs identified in the KSHV genome (Samols et al., 2007; Walz et al., 2010), KSHV miR-K9 and miR-K5 regulate the TLR/IL-1R signaling cascade by suppressing expression of the regulatory factors IRAK-1 and MyD88 (Abend et al., 2012). Interestingly, Yang et al. (2014) reported that constitutive phosphorylation of IRAK-1 in primary effusion lymphoma (PEL) is required for cell survival. This indicates that IRAK-1-mediated TLR signaling is a driving force in PEL growth and thus, IRAK-1 may be a potential therapeutic target for KSHV-associated pathogenesis. The NLR family consists of a central nucleotide-binding domain and C-terminal leucine-rich repeats (LRRs). The N-terminal portions of most NLRs harbor protein-protein interaction domains such as the caspase recruitment domain (CARD), pyrin domain (PYD), or baculovirus inhibitor repeats (BIRs) (Monie, 2013; Takeuchi and Akira, 2010). LRRs are though to play a role in PAMP sensing to allow the N-terminal PYD to bind to the adaptor protein, ASC, via a PYD-PYD interaction. ASC, which also contains a CARD domain, then binds to and activates caspase-1 through a CARD-CARD interaction (Franchi et al., 2009; Takeuchi and Akira, 2010). Collectively these large multimeric complexes are termed inflammasome. Inflammasome activated caspase-1 is a key effector molecule that cleaves proinflammatory cytokines IL-1β and IL-18, and induces an inflammatory form of cell death called pyroptosis (Schroder and Tschopp, 2010). In contrast to inflammasome formation, NLR members NOD1 and NOD2 induce the activation of IRF3, IRF7, NF-κB, and MAPK signaling pathways through RIP2/RICK binding (Coutermarsh-Ott et al., 2016; Lupfer and Kanneganti, 2013). Hence, NLR proteins regulate both the IFN and inflammatory pathways. Remarkably, KSHV ORF63, a viral homolog of cellular NLRP1, contains a LRR and a nucleotide-binding domain (NBD) that are required for oligomerization, but lacks the CARD and PYD effector domains of its cellular counterpart. Thus, ORF63 can directly interact with NLRP1 to block NLRP1-dependent caspase-1 activation, leading to the inhibition of IL-1β and IL-18 processing (Gregory et al., 2011). Additionally, ORF63 inhibits the NLRP3 inflammasome despite lacking significant similarity to NLRP3 (Gregory et al., 2011). Overall, KSHV utilizes ORF63 to broadly suppress NLR-mediated signaling during its life cycle. RLRs are cytoplasmic RNA helicases that function as viral RNA sensors. Currently, there are three known members of this family: Retinoic acid-inducible gene-I (RIG-I), laboratory of genetics and physiology 2 (LGP2), and melanoma differentiation gene 5 (MDA5) (McCartney and Colonna, 2009). Both RIG-I and MDA5 have central DExH/D box helicase domains for RNA binding and N-terminal CARDs for coupling downstream signaling adaptors (Brubaker et al., 2015; Gack et al., 2007; Pichlmair et al., 2006; Yoneyama et al., 2004; 2005). RIG-I preferentially recognizes short 5′-triphosphates sequence motifs in ssRNA and short dsRNA, while MDA5 recognizes long dsRNA for sensing (Kato et al., 2008; McCartney and Colonna, 2009; Saito and Gale, 2008; Saito et al., 2008). After sensing cytosolic viral RNA, RIG-I and MDA5, activate the mitochondrial antiviral signaling protein (MAVS) adaptor molecule. This initiates a signaling cascade to induce proinflammatory cytokines and type I IFN production (Fitzgerald et al., 2003). A growing body of evidence indicates that RIG-I is also involved in the recognition of DNA viruses, further highlighting the importance of RIG-I as a viral sensor (Cheng et al., 2007; Chiu et al., 2009). To counteract RIG-I signaling, KSHV ORF64, a viral deubiquitinase (DUB), decreases the ubiquitination of RIG-I to reduce RIG-I activation, and subsequently downregulates RIG-I-mediated IFN signaling (Inn et al., 2011). Furthermore, depletion of either MAVS or RIG-I increases global transcription of the viral genome upon de novo infection of KSHV, suggesting that RIG-I-mediated activation of MAVS inhibits KSHV transcription following primary infection (West et al., 2014). Thus, the immediate suppression of RIG-I mediated activation of type I IFNs during de novo KSHV infection and reactivation might allow them to efficiently evade host antiviral immune responses in order to establish their life cycle. Intracellular detection of pathogenic DNA is also critical for initiating host immune responses and eliminating microbial infection. So far, more than ten DNA cytosolic receptors have been identified: DAI, AIM2, RNA polymerase-III, IFI16, STING, LRRFIP1, Ku70, DHX9, DHX36, and cGAS (Brubaker et al., 2015; Sun et al., 2013; Takaoka et al., 2007). Currently, three DNA receptors, AIM2, IFI16, and cGAS, have been implicated as major sensors of intracellular DNA, especially during viral infection. Herein, we highlight how KSHV modulates IFI16 and cGAS to activate IFN responses during its life cycle. DNA binding proteins, IFI16 and AIM2 belong to the AIM2-like receptor (ALR) family involved in detecting intracellular DNA. ALR family proteins comprise of a PYRIN domain and a DNA-binding HIN-200 domain (Orzalli and Knipe, 2014). AIM2 was first identified as a receptor for cytosolic DNA, which forms an inflammasome together with the adaptor ASC to activate caspase-1 (de Zoete et al., 2014; Fernandes-Alnemri et al., 2009). Intriguingly, unlike AIM2 that is strictly localized to the cytoplasm, IFI16, an AIM2 related protein, can translocate between the cytoplasm and nucleus. However, at steadystate, IFI16 primarily localizes to the nucleus where IFI16 can bind to and activate IRF3 (Li et al., 2012; Orzalli and Knipe, 2014; Veeranki and Choubey, 2012). IFI16 coordinates a diverse range of immune pathways such as the activation of STING-dependent IFN production as well as inflammasome formation (Christensen and Paludan, 2016; Diner et al., 2015; Unterholzner et al., 2010). During KSHV infection in endothelial cells and B cells, KSHV DNA triggers IFI16 inflammasome assembly and activation of caspase-1 and IL-1β (Kerur et al., 2011; Singh et al., 2013). Furthermore, IFI16 has been shown to be involved in the induction of IFN-β production during KSHV de novo infection by targeting the IFI16-STING-IRF3 axis (Ansari et al., 2015). Very recently, Roy et al. (2016) demonstrated that IFI16 binds to the lytic gene promoter and acts as a transcriptional repressor to maintain viral latency. Overall, these observations indicate that the efficient maintenance of latency by IFI16 and the activation of the IFI16 inflammasome by latent KSHV could drive KSHV-associated inflammatory cytokine syndromes, like MCD. cGAMP synthase (cGAS), the most recently identified cytosolic DNA sensor, generates cGAMP (cyclic guanosine monophosphate-adenosine monophosphate) from ATP and GTP upon recognition of pathogen-derived DNA (Liu et al., 2016). The second messenger cGAMP stimulates STING-mediated TBK-1 activation, leading to activation of IRF3. IRF3 then induces the transcriptional activation of IFNs and other cytokines, consequently facilitating host immune responses (Ablasser et al., 2013; Gao et al., 2013; Sun et al., 2013). Since cGAS has been shown to play a key role in the type I interferon response against DNA viruses, Wu et al. (2015) recently revealed that KSHV ORF52 binds to DNA and cGAS, leading to the direct inhibition of cGAS enzymatic activity. An additional study showed that KSHV vIRF1 disrupts the TBK1-STING interaction and inhibits the cGAS-STING signaling axis, resulting in the inhibition of IFN-β production. Furthermore, depletion of vIRF1 in the context of KSHV induced high levels of IFN-β induction (Ma et al., 2015). Moreover, the short form of KSHV LANA, resulting from internal translation initiation, has also been shown to antagonize cGAS-STING mediated signaling by directly binding to cGAS (Zhang et al., 2016). Collectively, these clearly reinforce the key immunomodulatory role of cGAS, while providing evidence for KSHV immune evasion tactics for establishing latent and productive viral infection. PRR signaling, resulting from the interaction between PRRs and PAMPs, serves as gateways for the activation of selective genes required for generating innate immune responses. As reviewed here, KSHV has evolved elegant mechanisms to evade detection and destruction by the host innate immune system, especially PRR signaling, to effectively establish their lifecycle (Fig. 1). While these mounting studies have provided essential information regarding PRRs-mediated immune evasion by KSHV, it has yet to be determined how either KSHV-associated products or virion components stimulate PRRs. By adding to our growing knowledge of viral immunomodulatory proteins, we gain important insights into not only the diverse aspects of virus-host interactions, but also into the inner workings of host immunity. It is clear that PRR-mediated immune responses are key to coordinating many physiological and pathological processes. Further insights and developments into how viruses thwart PRR signaling will likely yield new approaches to the treatment of infectious and inflammatory diseases including KSHV-associated disorders. Fig. 1. KSHV evasion of different recognition receptors signaling. Recognition of KSHV viral components by host pattern recognition receptors (PRR) triggers signaling pathways that induce production of type I IFN and pro-inflammatory cytokines. Following KSHV infection of cells, TLRs utilize MyD88 and TRIF as adaptor molecules to recruit downstream molecules, which eventually culminates in the production of type I IFN and/or pro-inflammatory cytokines. Moreover, KSHV dsDNA accumulates in the cytoplasm and is recognized by cGAS and IFI16. In response to DNA stimulation, STING, an ER protein, relocates to the cytoplasmic punctate structures and subsequently recruits TBK1 and IKKɛ. Alternatively, dsDNA is transcribed into dsRNA polymerase III in a cell-type specific manner and is recognized by RIG-I. RLRs signal through the adaptor protein MAVS located on the mitochondria triggers production of type I IFN together with NF-κB. Inflammasome induction by KSHV infection, either results in the activation of IL-1β and IL-18 or inhibition of its production due to blockage of the NLRP1/3. Red squares indicate KSHV proteins. Abend, J.R., Ramalingam, D., Kieffer-Kwon, P., Uldrick, T.S., Yarchoan, R., and Ziegelbauer, J. M. (2012). Kaposi’s sarcoma-associated herpesvirus microRNAs target IRAK1 and MYD88, two components of the toll-like receptor/interleukin-1R signaling cascade, to reduce inflammatory-cytokine expression. J Virol. 86, 11663-11674. Ablasser, A., Goldeck, M., Cavlar, T., Deimling, T., Witte, G., Rohl, I., Hopfner, K.P., Ludwig, J., and Hornung, V. (2013). cGAS produces a 2′-5′-linked cyclic dinucleotide second messenger that activates STING. Nature. 498, 380-384. Ahmad, H., Gubbels, R., Ehlers, E., Meyer, F., Waterbury, T., Lin, R., and Zhang, L. (2011). Kaposi sarcoma-associated herpesvirus degrades cellular Toll-interleukin-1 receptor domain-containing adaptor-inducing beta-interferon (TRIF). J Biol Chem. 286, 7865-7872. Akira, S., Uematsu, S., and Takeuchi, O. (2006). Pathogen recognition and innate immunity. Cell. 124, 783-801. Ansari, M.A., Dutta, S., Veettil, M.V., Dutta, D., Iqbal, J., Kumar, B., Roy, A., Chikoti, L., Singh, V.V., and Chandran, B. (2015). Herpesvirus genome recognition induced acetylation of nuclear IFI16 is essential for its cytoplasmic translocation, inflammasome and IFN-beta responses. PLoS Pathog. 11, e1005019. Bauer, S., Kirschning, C.J., Hacker, H., Redecke, V., Hausmann, S., Akira, S., Wagner, H., and Lipford, G.B. (2001). Human TLR9 confers responsiveness to bacterial DNA via species-specific CpG motif recognition. Proc Natl Acad Sci USA. 98, 9237-9242. Beutler, B.A. (2009). TLRs and innate immunity. Blood. 113, 1399-1407. Brennan, K., and Bowie, A.G. (2010). Activation of host pattern recognition receptors by viruses. Curr Opin Microbiol. 13, 503-507. Brubaker, S.W., Bonham, K.S., Zanoni, I., and Kagan, J.C. (2015). Innate immune pattern recognition: a cell biological perspective. Annu Rev Immunol. 33, 257-290. Bussey, K.A., Reimer, E., Todt, H., Denker, B., Gallo, A., Konrad, A., Ottinger, M., Adler, H., Sturzl, M., and Brune, W. (2014). The gammaherpesviruses Kaposi’s sarcoma-associated herpesvirus and murine gammaherpesvirus 68 modulate the Toll-like receptor-induced proinflammatory cytokine response. J Virol. 88, 9245-9259. Cai, X., Chiu, Y.H., and Chen, Z.J. (2014). The cGAS-cGAMP-STING pathway of cytosolic DNA sensing and signaling. Mol Cell. 54, 289-296. Chang, Y., Moore, P.S., Talbot, S.J., Boshoff, C.H., Zarkowska, T., Godden, K., Paterson, H., Weiss, R.A., and Mittnacht, S. (1996). Cyclin encoded by KS herpesvirus. Nature. 382, 410. Cheng, G., Zhong, J., Chung, J., and Chisari, F.V. (2007). Double-stranded DNA and double-stranded RNA induce a common antiviral signaling pathway in human cells. Proc Natl Acad Sci USA. 104, 9035-9040. Chiu, Y.H., Macmillan, J.B., and Chen, Z.J. (2009). RNA polymerase III detects cytosolic DNA and induces type I interferons through the RIG-I pathway. Cell. 138, 576-591. Christensen, M.H., and Paludan, S.R. (2016). Viral evasion of DNA-stimulated innate immune responses. Cell Mol Immunol, 1-10. Coutermarsh-Ott, S., Eden, K., and Allen, I. C. (2016). Beyond the inflammasome: regulatory NOD-like receptor modulation of the host immune response following virus exposure. J Gen Virol. 97, 825-838. De Nardo, D. (2015). Toll-like receptors: Activation, signalling and transcriptional modulation. Cytokine. 74, 181-189.
de Zoete, M.R., Palm, N. W., Zhu, S., and Flavell, R. A. (2014). Inflammasomes. Cold Spring Harb Perspect Biol. 6, a016287. Diner, B.A., Lum, K. K., and Cristea, I. M. (2015). The emerging role of nuclear viral DNA sensors. J Biol Chem. 290, 26412-26421. Dittmer, D., Lagunoff, M., Renne, R., Staskus, K., Haase, A., and Ganem, D. (1998). A cluster of latently expressed genes in Kaposi’s sarcoma-associated herpesvirus. J Virol. 72, 8309-8315. Fernandes-Alnemri, T., Yu, J. W., Datta, P., Wu, J., and Alnemri, E.S. (2009). AIM2 activates the inflammasome and cell death in response to cytoplasmic DNA. Nature. 458, 509-513. Fitzgerald, K.A., McWhirter, S.M., Faia, K.L., Rowe, D.C., Latz, E., Golenbock, D.T., Coyle, A.J., Liao, S.M., and Maniatis, T. (2003). IKKepsilon and TBK1 are essential components of the IRF3 signaling pathway. Nat Immunol. 4, 491-496. Franchi, L., Warner, N., Viani, K., and Nunez, G. (2009). Function of Nod-like receptors in microbial recognition and host defense. Immunol Rev. 227, 106-128. Gack, M.U., Shin, Y.C., Joo, C.H., Urano, T., Liang, C., Sun, L., Takeuchi, O., Akira, S., Chen, Z., Inoue, S., and Jung, J.U. (2007). TRIM25 RING-finger E3 ubiquitin ligase is essential for RIG-I-mediated antiviral activity. Nature. 446, 916-920. Ganem, D. (2010). KSHV and the pathogenesis of Kaposi sarcoma: listening to human biology and medicine. J Clin Invest. 120, 939-949. Gao, D., Wu, J., Wu, Y.T., Du, F., Aroh, C., Yan, N., Sun, L., and Chen, Z.J. (2013). Cyclic GMP-AMP synthase is an innate immune sensor of HIV and other retroviruses. Science. 341, 903-906. Gregory, S.M., West, J.A., Dillon, P.J., Hilscher, C., Dittmer, D.P., and Damania, B. (2009). Toll-like receptor signaling controls reactivation of KSHV from latency. Proc Natl Acad Sci USA. 106, 11725-11730. Gregory, S.M., Davis, B.K., West, J.A., Taxman, D.J., Matsuzawa, S., Reed, J.C., Ting, J.P., and Damania, B. (2011). Discovery of a viral NLR homolog that inhibits the inflammasome. Science. 331, 330-334. Hoffmann, J., and Akira, S. (2013). Innate immunity. Curr Opin Immunol. 25, 1-3. Inn, K.S., Lee, S.H., Rathbun, J.Y., Wong, L.Y., Toth, Z., Machida, K., Ou, J.H., and Jung, J.U. (2011). Inhibition of RIG-I-mediated signaling by Kaposi’s sarcoma-associated herpesvirus-encoded deubiquitinase ORF64. J Virol. 85, 10899-10904. Iwasaki, A., and Medzhitov, R. (2004). Toll-like receptor control of the adaptive immune responses. Nat Immunol. 5, 987-995. Jacobs, S.R., Gregory, S.M., West, J.A., Wollish, A.C., Bennett, C.L., Blackbourn, D.J., Heise, M.T., and Damania, B. (2013). The viral interferon regulatory factors of kaposi’s sarcoma-associated herpesvirus differ in their inhibition of interferon activation mediated by toll-like receptor 3. J Virol. 87, 798-806. Jacobs, S.R., Stopford, C.M., West, J.A., Bennett, C.L., Giffin, L., and Damania, B. (2015). 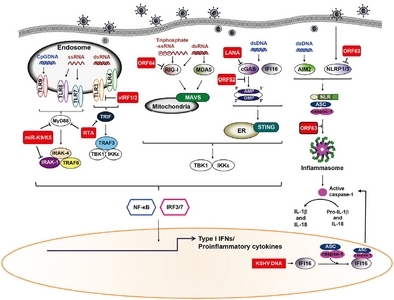 Kaposi’s sarcoma-associated herpesvirus viral interferon regulatory factor 1 Interacts with a member of the interferon-stimulated gene 15 pathway. J Virol. 89, 11572-11583. Kato, H., Takeuchi, O., Mikamo-Satoh, E., Hirai, R., Kawai, T., Matsushita, K., Hiiragi, A., Dermody, T.S., Fujita, T., and Akira, S. (2008). Length-dependent recognition of double-stranded ribonucleic acids by retinoic acid-inducible gene-I and melanoma differentiation-associated gene 5. J Exp Med. 205, 1601-1610. Kedes, D.H., Lagunoff, M., Renne, R., and Ganem, D. (1997). Identification of the gene encoding the major latency-associated nuclear antigen of the Kaposi’s sarcoma-associated herpesvirus. J Clin Invest. 100, 2606-2610. Kerur, N., Veettil, M.V., Sharma-Walia, N., Bottero, V., Sadagopan, S., Otageri, P., and Chandran, B. (2011). IFI16 acts as a nuclear pathogen sensor to induce the inflammasome in response to Kaposi Sarcoma-associated herpesvirus infection. Cell Host Microbe. 9, 363-375. Lagos, D., Vart, R.J., Gratrix, F., Westrop, S.J., Emuss, V., Wong, P.P., Robey, R., Imami, N., Bower, M., and Gotch, F. (2008). Toll-like receptor 4 mediates innate immunity to Kaposi sarcoma herpesvirus. Cell Host Microbe. 4, 470-483. Lee, M. S., and Kim, Y.J. (2007). Pattern-recognition receptor signaling initiated from extracellular, membrane, and cytoplasmic space. Mol Cells. 23, 1-10. Lee, H.R., Brulois, K., Wong, L., and Jung, J.U. (2012). Modulation of immune system by Kaposi’s sarcoma-associated herpesvirus: lessons from viral evasion strategies. Front Microbiol. 3, 44. Lee, H.R., Amatya, R., and Jung, J.U. (2015). Multi-step regulation of innate immune signaling by Kaposi’s sarcoma-associated herpesvirus. Virus Res. 209, 39-44. Li, T., Diner, B.A., Chen, J., and Cristea, I.M. (2012). Acetylation modulates cellular distribution and DNA sensing ability of interferon-inducible protein IFI16. Proc Natl Acad Sci USA. 109, 10558-10563. Liu, S., Grinberg, I., and Rappe, A.M. (2016). Intrinsic ferroelectric switching from first principles. Nature. 534, 360-363. Lupfer, C., and Kanneganti, T.D. (2013). The expanding role of NLRs in antiviral immunity. Immunol Rev. 255, 13-24. Ma, Z., Jacobs, S.R., West, J.A., Stopford, C., Zhang, Z., Davis, Z., Barber, G.N., Glaunsinger, B.A., Dittmer, D.P., and Damania, B. (2015). Modulation of the cGAS-STING DNA sensing pathway by gammaherpesviruses. Proc Natl Acad Sci USA. 112, E4306-4315. McCartney, S.A., and Colonna, M. (2009). Viral sensors: diversity in pathogen recognition. Immunol Rev. 227, 87-94. Meyer, F., Ehlers, E., Steadman, A., Waterbury, T., Cao, M., and Zhang, L. (2013). TLR-TRIF pathway enhances the expression of KSHV replication and transcription activator. J Biol Chem. 288, 20435-20442. Monie, T.P. (2013). NLR activation takes a direct route. Trends Biochem Sci. 38, 131-139. Nador, R.G., Cesarman, E., Chadburn, A., Dawson, D.B., Ansari, M.Q., Sald, J., and Knowles, D.M. (1996). Primary effusion lymphoma: a distinct clinicopathologic entity associated with the Kaposi’s sarcoma-associated herpes virus. Blood. 88, 645-656. O’Neill, L.A., Golenbock, D., and Bowie, A.G. (2013). The history of Toll-like receptors - redefining innate immunity. Nat Rev Immunol. 13, 453-460. Orzalli, M.H., and Knipe, D.M. (2014). Cellular sensing of viral DNA and viral evasion mechanisms. Annu Rev Microbiol. 68, 477-492. Paludan, S.R., Bowie, A.G., Horan, K.A., and Fitzgerald, K.A. (2011). Recognition of herpesviruses by the innate immune system. Nat Rev Immunol. 11, 143-154. Pichlmair, A., Schulz, O., Tan, C.P., Naslund, T.I., Liljestrom, P., Weber, F., and Reis e Sousa, C. (2006). RIG-I-mediated antiviral responses to single-stranded RNA bearing 5′-phosphates. Science. 314, 997-1001. Roy, A., Dutta, D., Iqbal, J., Pisano, G., Gjyshi, O., Ansari, M.A., Kumar, B., and Chandran, B. (2016). Nuclear innate immune DNA sensor IFI16 is degraded during lytic reactivation of Kaposi’s sarcoma-associated herpesvirus (KSHV): role of IFI16 in maintenance of KSHV latency. J Virol. 90, 8822-8841. Saito, T., and Gale, M. (2008). Differential recognition of double-stranded RNA by RIG-I-like receptors in antiviral immunity. J Exp Med. 205, 1523-1527. Saito, T., Owen, D.M., Jiang, F., Marcotrigiano, J., and Gale, M. (2008). Innate immunity induced by composition-dependent RIG-I recognition of hepatitis C virus RNA. Nature. 454, 523-527. Samols, M.A., Skalsky, R.L., Maldonado, A.M., Riva, A., Lopez, M.C., Baker, H.V., and Renne, R. (2007). Identification of cellular genes targeted by KSHV-encoded microRNAs. PLoS Pathog. 3, e65. Singh, V.V., Kerur, N., Bottero, V., Dutta, S., Chakraborty, S., Ansari, M.A., Paudel, N., Chikoti, L., and Chandran, B. (2013). Kaposi’s sarcoma-associated herpesvirus latency in endothelial and B cells activates gamma interferon-inducible protein 16-mediated inflammasomes. J Virol. 87, 4417-4431. Soulier, J., Grollet, L., Oksenhendler, E., Cacoub, P., Cazals-Hatem, D., Babinet, P., d’Agay, M.F., Clauvel, J.P., Raphael, M., and Degos, L. (1995). Kaposi’s sarcoma-associated herpesvirus-like DNA sequences in multicentric Castleman’s disease. Blood. 86, 1276-1280. Sun, L., Wu, J., Du, F., Chen, X., and Chen, Z.J. (2013). Cyclic GMP-AMP synthase is a cytosolic DNA sensor that activates the type I interferon pathway. Science. 339, 786-791. Takaoka, A., Wang, Z., Choi, M.K., Yanai, H., Negishi, H., Ban, T., Lu, Y., Miyagishi, M., Kodama, T., and Honda, K. (2007). DAI (DLM-1/ZBP1) is a cytosolic DNA sensor and an activator of innate immune response. Nature. 448, 501-505. Takeda, K., and Akira, S. (2004). TLR signaling pathways. Semin Immunol. 16, 3-9. Unterholzner, L., Keating, S.E., Baran, M., Horan, K.A., Jensen, S.B., Sharma, S., Sirois, C.M., Jin, T., Latz, E., and Xiao, T.S. (2010). IFI16 is an innate immune sensor for intracellular DNA. Nat Immunol. 11, 997-1004. Veeranki, S., and Choubey, D. (2012). Interferon-inducible p200- family protein IFI16, an innate immune sensor for cytosolic and nuclear double-stranded DNA: regulation of subcellular localization. Mol Immunol. 49, 567-571. Walz, N., Christalla, T., Tessmer, U., and Grundhoff, A. (2010). A global analysis of evolutionary conservation among known and predicted gammaherpesvirus microRNAs. J Virol. 84, 716-728. West, J., and Damania, B. (2008). Upregulation of the TLR3 pathway by Kaposi’s sarcoma-associated herpesvirus during primary infection. J Virol. 82, 5440-5449. West, J.A., Gregory, S.M., Sivaraman, V., Su, L., and Damania, B. (2011). Activation of plasmacytoid dendritic cells by Kaposi’s sarcoma-associated herpesvirus. J Virol. 85, 895-904. West, J.A., Wicks, M., Gregory, S.M., Chugh, P., Jacobs, S.R., Zhang, Z., Host, K.M., Dittmer, D. P., and Damania, B. (2014). An important role for mitochondrial antiviral signaling protein in the Kaposi’s sarcoma-associated herpesvirus life cycle. J Virol. 88, 5778-5787. Wu, J.J., Li, W., Shao, Y., Avey, D., Fu, B., Gillen, J., Hand, T., Ma, S., Liu, X., and Miley, W. (2015). Inhibition of cGAS DNA sensing by a herpesvirus virion protein. Cell Host Microbe. 18, 333-344. Yang, D., Chen, W., Xiong, J., Sherrod, C.J., Henry, D.H., and Dittmer, D.P. (2014). Interleukin 1 receptor-associated kinase 1 (IRAK1) mutation is a common, essential driver for Kaposi sarcoma herpesvirus lymphoma. Proc Natl Acad Sci USA. 111, E4762-4768. Yoneyama, M., Kikuchi, M., Natsukawa, T., Shinobu, N., Imaizumi, T., Miyagishi, M., Taira, K., Akira, S., and Fujita, T. (2004). The RNA helicase RIG-I has an essential function in double-stranded RNA-induced innate antiviral responses. Nat Immunol. 5, 730-737. Yoneyama, M., Kikuchi, M., Matsumoto, K., Imaizumi, T., Miyagishi, M., Taira, K., Foy, E., Loo, Y.M., Gale, M., and Akira, S. (2005). Shared and unique functions of the DExD/H-box helicases RIG-I, MDA5, and LGP2 in antiviral innate immunity. J Immunol. 175, 2851-2858. Zhang, G., Chan, B., Samarina, N., Abere, B., Weidner-Glunde, M., Buch, A., Pich, A., Brinkmann, M.M., and Schulz, T.F. (2016). Cytoplasmic isoforms of Kaposi sarcoma herpesvirus LANA recruit and antagonize the innate immune DNA sensor cGAS. Proc Natl Acad Sci USA. 113, E1034-1043. Zhao, Q., Liang, D., Sun, R., Jia, B., Xia, T., Xiao, H., and Lan, K. (2015). Kaposi’s Sarcoma-associated herpesvirus-encoded replication and transcription activator impairs innate immunity via ubiquitin-mediated degradation of myeloid differentiation factor 88. J Virol. 89, 415-427. Zhong, W., Wang, H., Herndier, B., and Ganem, D. (1996). Restricted expression of Kaposi sarcoma-associated herpesvirus (human herpesvirus 8) genes in Kaposi sarcoma. Proc Natl Acad Sci USA. 93, 6641-6646.